World Press Photo Of The Year Is 'Explosive' Image Of An Assassination : The Two-Way Photographer Burhan Ozbilici's image of the killing of Russia's ambassador to Turkey was described by one jury member as the "face of hatred." Jurors have made it clear that it was a heated debate. World Press Photo awarded its top honor to Burhan Ozbilici's image of a man with a gun standing over the slain Russian ambassador in Ankara in December. The image that won the 2017 World Press Photo of the Year award was described by one jury member as the "face of hatred." 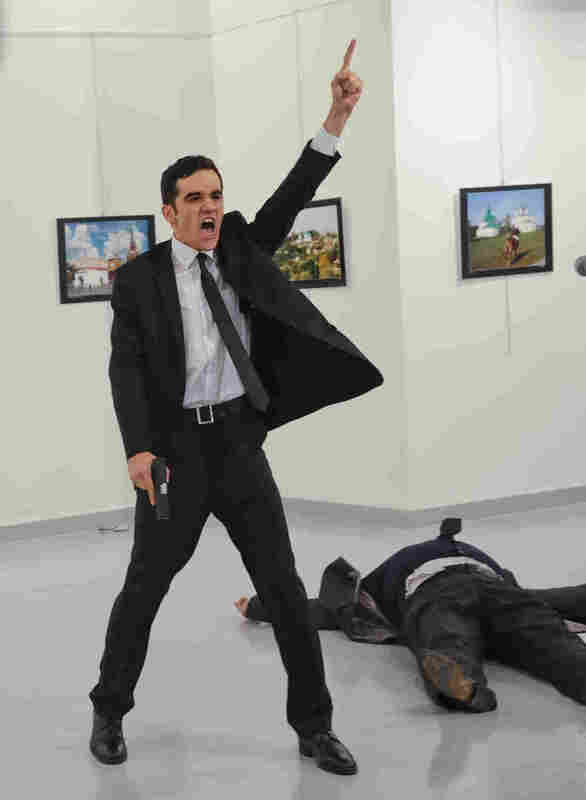 It shows a shouting, suit-clad gunman standing in an art gallery in Turkey's capital, one hand holding a weapon, the other pointing to the sky. On the ground next to him is the crumpled body of his victim, Russian Ambassador Andrei Karlov. Associated Press photographer Burhan Ozbilici, who happened to stop in at the gallery in Ankara on his way home from work on Dec. 19, 2016, was just a few feet away from the shooting and documented the harrowing event. "I remember thinking: 'I might be killed or injured, but the Russian ambassador has been shot. This is very big news, so as a journalist it is my responsibility to stand and do my work,' " Ozbilici said in an interview with World Press Photo's Witness magazine. "Even if I was killed, there would still be photos." Jury members made it clear there was a difficult debate over whether selecting the photo might send the wrong message. "In the end we felt that the picture of the Year was an explosive image that really spoke to the hatred of our times," jury member Mary Calvert said in a statement. "Every time it came on the screen you almost had to move back because it's such an explosive image and we really felt that it epitomizes the definition of what the World Press Photo of the Year is and means." For juror João Silva, this photo gives a sense of the current global moment: "I feel that what is happening in Europe, what is happening in America, what is happening in the Far East, Middle East, Syria, and this image to me talks of it. It is the face of hatred." "To be clear, my moral position is not that the well-intentioned photographer should be denied the credit he deserves; rather that I feared we'd be amplifying a terrorist's message through the additional publicity that the top prize attracts." Calvert told The New York Times that jury was "rewarding the photographer, not rewarding the crime" — and the image is a powerful, historically relevant record of our current moment. Ozbilici told Witness that his work "represented a long tradition of good, independent journalism and good news photos." And that makes him "happy and proud — proud of all good journalists, those living and those who have been killed doing their work, at a time when people are trying to manipulate the media, and the quality of journalism is often ignored."